Boulder based Graphicly, best known for its comics reading and purchasing platform on mobile devices, desktop and the iPad, is expanding its reach to the Web with the relaunch of a brand new Web site which brings comic book reading to the browser, along with expanded community features and the new option to share comics and stories around the Web for fellow fans. The Web launch, on the foundation of HTML5, hopes to not sacrifice any of the user experience while making access to all the digital media independent of the device. 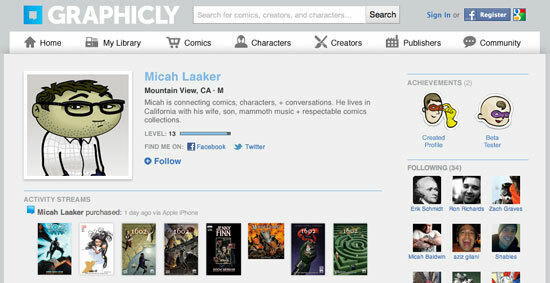 Graphicly, whose most visible advocate is well known social Web personality Micah Baldwin, the cofounder who has led the charge for the company since officially joining at the start of 2010, has doubled its user base over the last six months, and is now seeing a new comic book downloaded every minute. True to form, Graphicly reports every social action taken by a member of the community is viewed more than 400 separate times. This tight connection with community and inherent virality of comics is a major reason the company has doubled down on sharing capabilities with its new site, which goes live today. 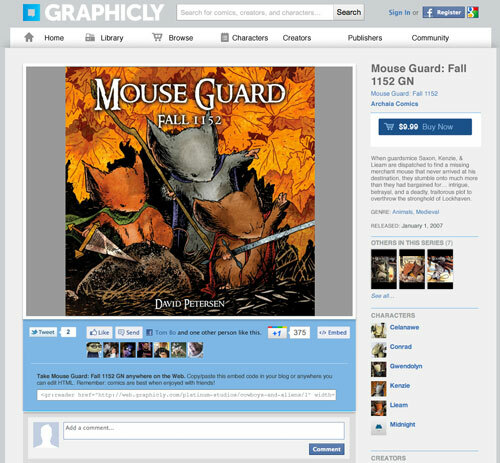 Starting today, comics and other Graphicly content can be shared across the Web, putting publisher content in front of more viewers, all of whom can convert to paying Graphicly users with some effort. Graphicly's approach has been to bring the same consumption, buying, social and sharing experience across all screens. “With our focus on HTML5, storytelling, collaboration and sharing that you can be done anywhere online or mobile, Graphicly’s full vision is becoming a reality," said Baldwin. "over the past year, we have met a lot of awesome fans, creators and stories, and they have no place to truly interact online. This release is the first move towards allowing all that awesome to connect in one place." With the battle over the definition of the cloud raging between the major Web giants, Graphicly has sided with both approaches - building dedicated apps and even being featured at Google IO for its Chrome Web app, but now moving into the full Web, backed by HTML 5. This sets them up nicely for reaching any mobile or desktop device its users want to leverage to read content. In fact, they promise in a release today to help bring author content to Kindle, Barnes and Noble Nook, or "any platform they choose". You can find the new Graphicly at http://www.graphicly.com, or just search for Graphicly in practically any app store.